Hope the toe feels better soon, so where's the radiator going? My toe feels better today still purple.. I'm a put the radiator where it looks the best first and see if it works out.. Probably right underneath the rear window.. The problem with radiators they need to be in the airflow to work properly. Airflow is a big deal or it'll overheat for sure. It also has to be somewhat level with the block too from what I've seen or you'll have coolant flow issues. Have you considered in front? Where's the condenser for your A/C? there is no coolant flow issues with radiator height it only comes into play if the radiator is low on coolant is long as you keep your radiator topped off it's not an issue that I know.. Thought about putting the radiator up front briefly anyway I cut it, have airflow issues.. All three of my condensers are located in the front of the vehicle. One of my condensers is located in the airflow and two of them are by forced air only.. I'm hoping that the radiator I plan the use has enough surface area to keep the motor cool at highway speeds.... This is my first Baja that I've ever put a water pumper it.. So I have no idea what to expect when I plan on doing is placing the radiator and getting a bunch of pieces of yarn and taping them all over the back of the vehicle taking my go Pro and pointing them out the pieces of yarn and driving at highway speeds and see what the airflow does this will help determine my final radiators position. good job on the exhaust I would say put the radiator out back and push the air with fans when it gets hot for them to run. By the way did I say it is looking good. Thank you my friend... I am not supper happy with the way the exhaust came out .... but most of the ugly is hidden by the skid plate. I really love the looks of this motor in this car... I must have researched 7 to 10 other motors before I chose this one.. I really hesitated going with this legacy technology.. The fuel economy is not what I would get with a more current technology but at least the horse power is there.. it just fit the bill.. This isn't going to be my daily driver so the loss in fuel economy was not a factor. When I looked at the application of how I was can use this vehicle the Subaru motor kept Rising to the top.. I was kind of looking forward to getting in the minds of the Honda engineers... If I was building a full-blown Baja and wasn't concerned about cutting the firewall I believe that the Honda motor would've been my best option.. 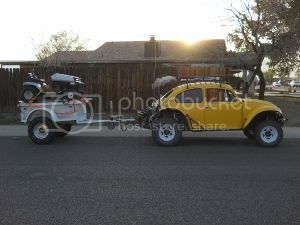 I it even sat down in engineered a method to utilize the drive by wire system in my Baja,,,.. I think that would've been kind of cool... I've yet to see someone that is successfully grafted in a drive by wire system into an off-road vehicle.. I can't wait to see how it turns out.! If you wanted economy put a 1300cc on there. Is this engine lighter than a comparable Honda? I hope you find a way of keeping the cool factor of that engine, the radiator might hide it too much. I dropped by Dalton's and hopefully I wasn't in the way too much or a distraction, but we got his exhaust welded up. not too much of a distraction.... I got the exhaust done... that's what I wanted to get done today.. it came out good... it will last ..
think I am going to work on the air intake and power steering next. I got a friend that wants to copy the wireing harness before I seal it up... so I am kinda holding off on working on it. Hey Dalton....thanks for the link to this site. Will be keeping an eye on you. Look forward to hooking up this weekend to see what you are up to. Your bender looks like the one I have had for 25 years. Mine is a HOSSFELD and I have a ton of dyes for it...if you ever need a specific size...let me know. Those aren't tan lines...... They are flash burns. Thanks Rick.... I am really looking forward to seeing some of your work on this site. Dalton....Still interested in having me come by tomorrow? I have to run to Hyder in the morning but we plan to be back around 9-10am. I will call you on the way back to town.